Today , Thousands of New Yorkers pledged their hearts and soles to the Making Strides Against Breast Cancer fund-raising walk . 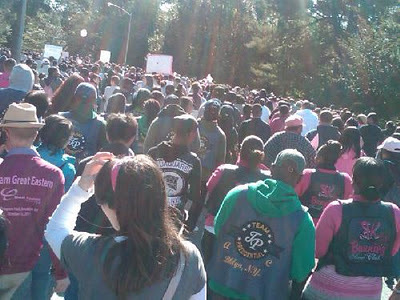 The event, sponsored by the American Cancer Society was held across the nation, including walks in New York City, Westchester, Long Island and New Jersey. "Breast cancer is the No. 1 cancer that affects women across the country. These walks are critical because they're our vehicle for supporting the fight against this disease," said Jennifer Podoll, spokeswoman for the American Cancer Society of New York and New Jersey. Organizers said 248,100 walkers in New York and New Jersey raised $18.4 million last year through pledges. The donations fund medical research as well as free support programs such as Hope Lodge on W. 32nd St. in Manhattan, which offers no-cost housing to cancer patients getting treatment in the city. "Since 1971, we have funded $338 million in breast cancer research. We have made significant progress, but we have a lot more work to do," said Dr. Alvaro Carrascal, a professor at the State University at Albany who heads the cancer society's public education efforts in New York. He said breast cancer death rates decreased 30% between 1991 and 2007, but an estimated 40,000 American women will die from the disease in 2011. The Making Strides walks are important, he said, because they helped raise the $82 million that the cancer society used to fund 220 breast cancer research projects in the U.S. this year alone. Podoll said the cancer society doesn't have a fund-raising goal beyond making this year bigger than last, when nearly 800,000 walkers collected more than $60 million nationwide. The walks range in distance from 5 kilometers (3.1 miles) to 5 miles, depending upon the location. Start times vary.